One of the most remarkable economic turnarounds of the latter half of the 20th century saw the phrase “Made in Japan” transformed from a euphemism for “cheap and tinny” into the hallmark of some of the best electronics, cars and motorcycles made. Now South Korea seems poised to follow in Japan’s footsteps and assert itself as a world-class manufacturer of, among other things, motorcycles. The Hyosung GT650S Comet proves one Korean bike maker hasn’t caught up to Japan just yet, but has the raw material to start making its move. 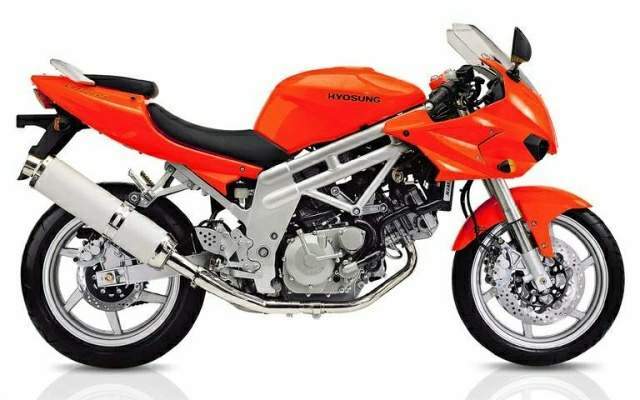 In 1979, a year after it was founded as a motorcycle manufacturer, Hyosung Motors & Machinery Inc. formed a technical alliance with Suzuki of Japan, which might account for the GT650S’s striking similarity to Suzuki’s SV650. The GT650S’s 647cc V-twin engine is shared by the GT650R, a fully faired version of the S, and the cruiser-styled GV650. Hyosung also makes a GV250 cruiser and a GT250, as well as an ATV and several scooters. I cadged a ride on a GT650S thanks to Hyosung dealer Rod Johnson, owner of Cycle Parts in Eugene, Oregon. When I arrived, I found the bike waiting for me had just a single mile on the odometer. Alongside the S sat Johnson’s personal GT650R, which had an aftermarket exhaust and a jet kit, and 350 miles on the clock. Photo model Paul and I took off on the bikes and headed for the country on winding roads. Advertisement The GT650S stood out immediately by virtue of its almost non-existent front braking power. It took a manly squeeze of the lever just to produce enough force to make the front end dive. It felt more like a poorly adjusted drum brake than a modern disc brake. By contrast, the R model’s more broken-in front brake worked much better, but still wasn’t up to class standards. Both felt mushy, as if in need of bleeding or a good set of aftermarket pads. Both, too, improved the more they were used, but not nearly enough. The lack of stopping power was doubly disheartening because the plucky little carbureted V-twin engine was so eager. It’s very smooth throughout the powerband, and revs willingly to its 10,500-rpm redline. But the bulk of its torque lives between 4,000 and 8,000 rpm, with enough on tap to hustle along a backroad so quickly you won’t miss spinning the tach needle to five digits. Gearing seems tall for a middleweight—4,000 rpm in sixth gear corresponds to about 60 mph. The GT650S’s inverted cartridge-type front fork, which has adjustable rebound and compression damping, works very well over a variety of surfaces, rounding off hard-edged bumps with a minimum of fuss. The rear shock offers only spring preload, but complements the fork’s response to road warts. Even with my 270 pounds aboard, the GT650S never bottomed or wallowed. The riding position appears cramped, but the close spacing between the seat and the bars makes it feel less so. The bars themselves are angled comfortably, and the switchgear works well and is easy to operate even in heavy gloves. The foot controls are adjustable to three positions, thanks to several holes on the mounting plates. An analog tachometer accompanies the digital speedometer and instrument panel, the readouts of which are so dim as to be all but invisible in direct sunlight or when viewed from behind a dark face shield. The turn-signal indicator is especially hard to see. Several times both Paul and I rode for miles with our signals blinking before one of us alerted the other. Out on the backroads the GT650S showed it has most of the right stuff to keep up with the competition. It’s stable in corners though not especially flickable, requiring a deliberate tug at the bar to initiate a turn. Repeated hard stops eventually convinced the surly front binder to wake up and start acting sort of like a twin-disc brake. Ridden within limits appropriate to the situation, the GT650S was a hoot. Paul, aboard the kitted R, summed it up with a grin. “This one’s a little troublemaker,” he said. 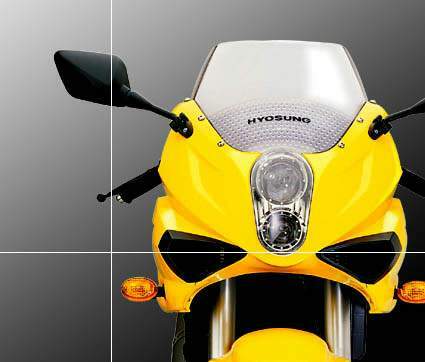 It’s apparent that Hyosung is onto something with the GT650S. At the same time it’s clear that the bike needs brakes to match its engine, and instrumentation that meets the same standard as its suspension and handling. 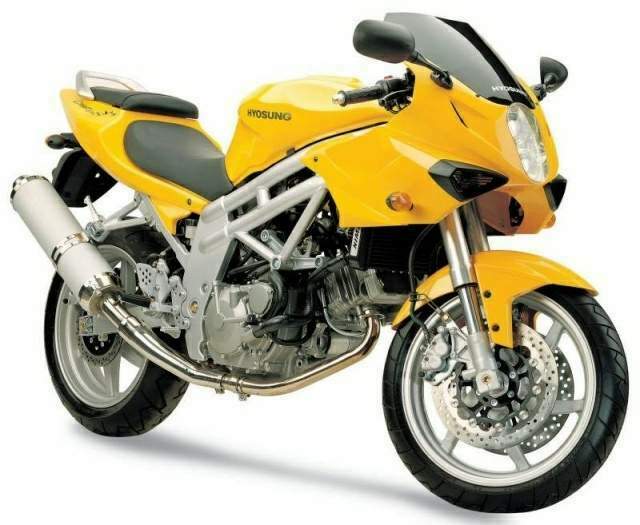 And of course the elephant in the attic is whether buying a Hyosung GT650S for just under a thousand dollars less than a Suzuki SV650 (MSRP $6,449) is worth giving up the Suzuki’s larger dealer network, parts availability and aftermarket coverage. Remember, though, that early Japanese motorcycles had what many enthusiasts of the time considered fatal flaws, and that Japan not only addressed them but rose to a position of dominance in the world motorcycle market. Hyosung is no serious threat to Japan just yet, but judging by the GT650S, it might not be long.